After the slowness of the holidays, getting back into the swing of things in January can be hard. My favorite easy way to get dinner on the table quickly? 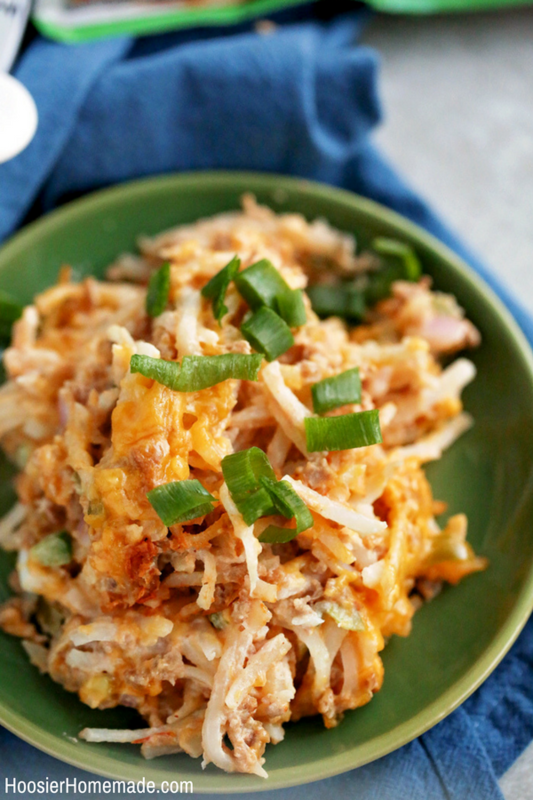 This Crock Pot Hash Brown Casserole –easy and delicious! I already miss the slow speed of our December! The boys were home, we tried not to have a lot of obligations, and so cooking dinner together was the highlight of our day! 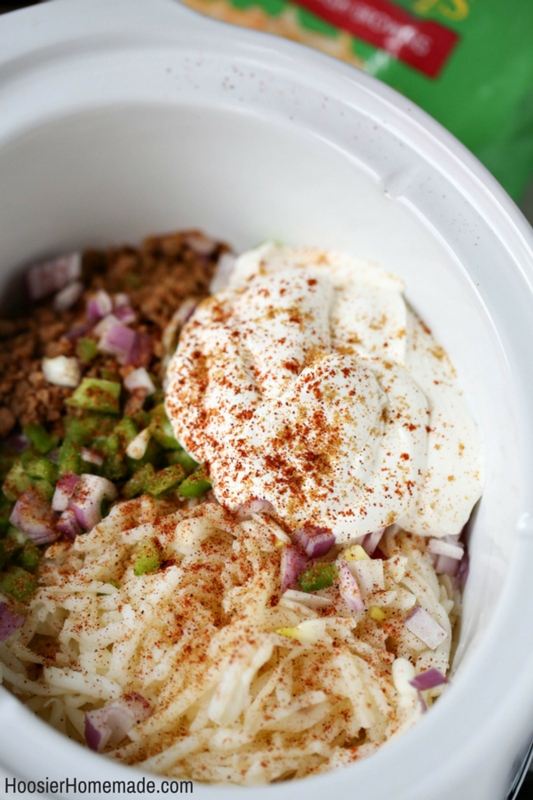 Now that we are back to the craziness of normal life, I am using my crock pot more and more! 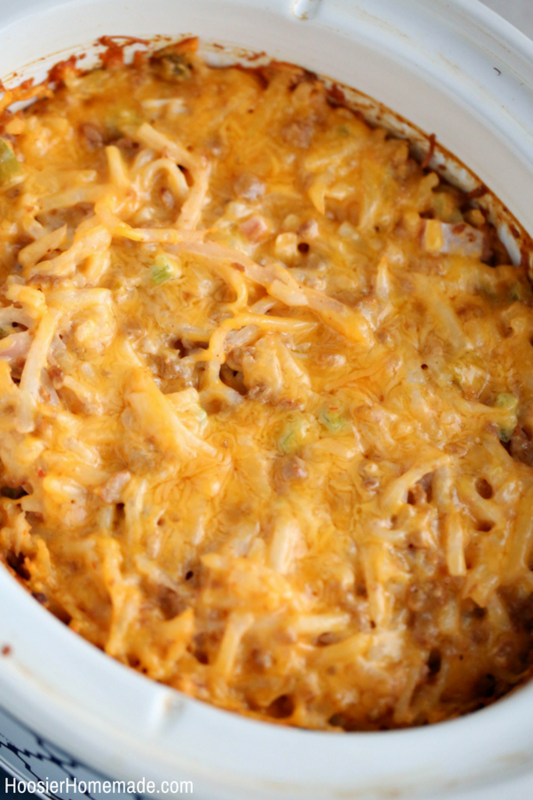 This crock pot hash brown casserole is so good- and so warm for the cold winter months. Plus it is fast! 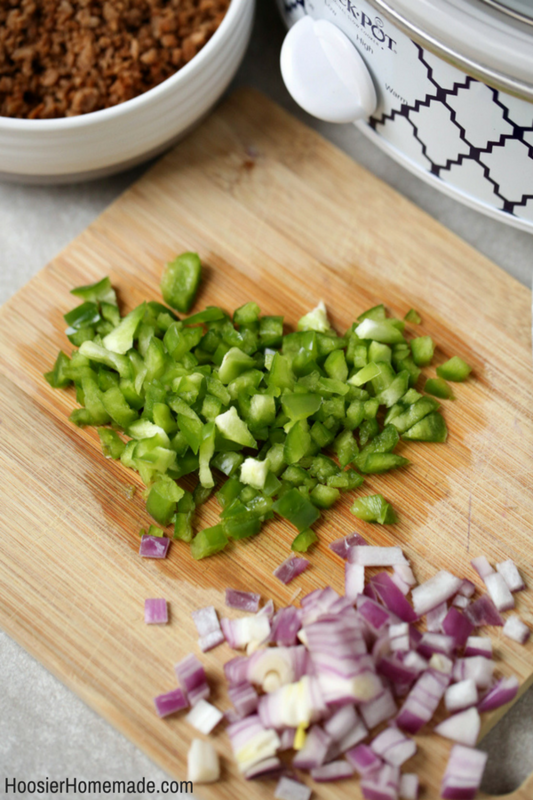 To prepare, all you need to do is dice the pepper and onions and cook the ground beef (I usually cook extra so we can have tacos later in the week!). Then add everything to the crock pot- but only half of the cheese! My secret weapon for crock pot casseroles? 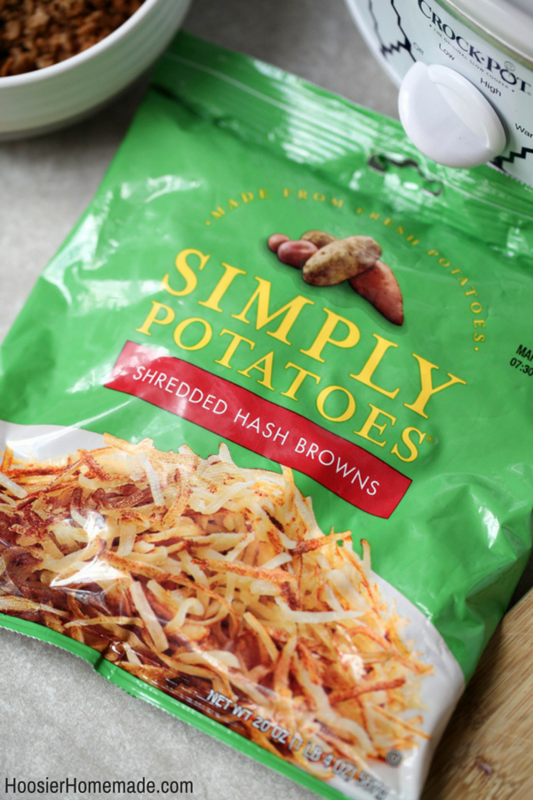 Simply Potatoes® Hash Browns. They are found in the refrigerator section- because the potatoes are never frozen it makes them so tasty. Plus, my casserole cooks quicker because nothing is frozen. I love products that make my life easier- without sacrificing quality. Once everything is in, stir it well and cook for 2 hours on low. Then, add the rest of the cheese and cook for an additional hour. At this point, I can hardly wait to eat because it smells so good! Top with green onions or any other toppings! One of my boys likes ketchup, one likes bacon bits, and the other likes it plain! This is such an easy weeknight meal- and feeds all of us (even hungry boys!). When it is just Doug and I we have lots of leftovers, great for breakfast the next morning or as a side for dinner the rest of the week! What are your thoughts on breakfast for dinner? It is one of my favorite things! 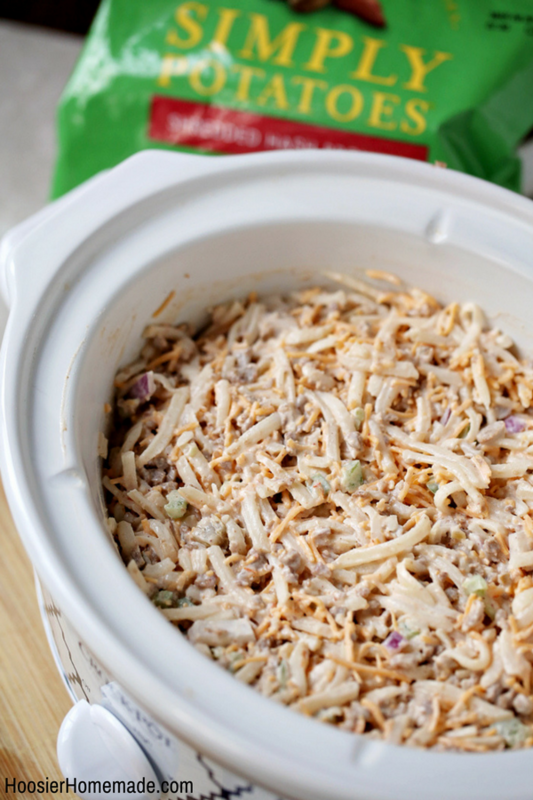 Do you have a favorite crock pot meal? 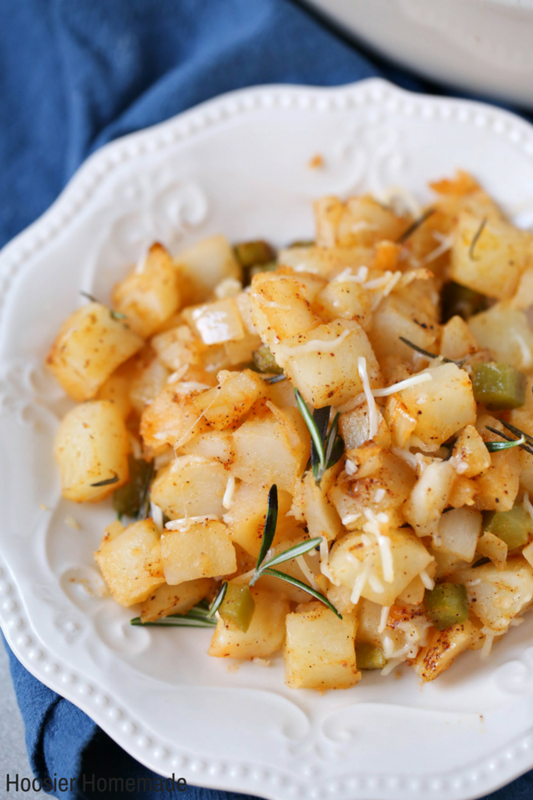 Rosemary Parmesan Potatoes- a great recipe for brunch! Cut pepper and onions, then combine in a large bowl with potatoes, rosemary, chili powder, paprika, salt, garlic, and half of your parmesan cheese. Pour into a baking dish and bake on 375 for 35 minutes. When fully cooked, sprinkle remaining parmesan on top and serve. I think the wrong recipe is at the bottom of the page – the page talks about hash brown casserole with ground beef but the recipe at the bottom is for rosemary parmesan potatoes? The hash brown casserole looks lovely! Thanks for letting me know Tina! Your photo shows sour cream or yogurt but your ingredients don’t reflect it. Did you add sour cream? Yes, my apologies, I will correct the recipe. Add 1 cup of sour cream.